At 27,000 feet, Amelia Rose Earhart was soaring over Howland Island, the intended destination of legendary aviatrix Amelia Earhart, when she used a small handheld GPS device to tweet the names of the young women who were set to receive flight-training scholarships from her own aviation non-profit organization, the Fly With Amelia Foundation. This experience, which Earhart describes as the proudest moment not only of her 28,000-mile circumnavigation of the globe but also of her life, combined her passion for aviation, her curiosity for her namesake and her mission to spark an interest in the next generation of female pilots. But aviation had not always been an integral part of Earhart’s life. Throughout most of her childhood, she went by the nickname “Amy” rather than her full name, Amelia. It wasn’t until Earhart was 18 years old that she felt comfortable in embracing her namesake and accepting what it might have to offer. “I just found that people were instantly engaged in conversation with me. It was all about asking questions about the history of the name and asking questions about whether or not I would be a pilot or if I could ever fly around the world. So, it was a good thing,” Earhart says. At 21 years old, after Earhart had saved up enough money to pursue a private pilot’s license, she took her discovery flight, which is an introductory flight lesson, at the Boulder Airport and fell in love with flying from that moment forward. “I was like, ‘Gosh, it’s really lucky that I actually like to do this,’ because if I didn’t, I kind of felt that my whole life I would be explaining why I wasn’t a pilot,” Earhart says. With a budding career as a radio and television reporter, Earhart worked long hours, sometimes starting as early as 2:30 a.m., which made it difficult to find enough time to fly. “For me, it was that work-life balance of knowing that flying wouldn’t necessarily be a career, but it would be a hobby,” Earhart says. Soon enough, her hobby began to become an even larger part of her life. Rather than continue on with a normal job and simply look to aviation as a hobby, Earhart says, she decided to embrace and honor her namesake by symbolically completing the flight the first Amelia Earhart started in 1937. “I thought, ‘What if I can go, pick up where she left off, do the flight in a modern-day aircraft, and show the world that it’s absolutely possible with today’s technology to have a safe flight around the world?’” Earhart says. Earhart quit her job, eliminated most of her social life and took a year and a half to plan her endeavor. On June 26, Earhart began her journey around the world. Flying eastbound out of Oakland, Calif., her flight around the world took a total of 18 days to complete and included stops in 14 countries while crossing the equator six times. She flew anywhere between seven and 10 hours each day at an average of 27,000 feet in a Pilatus PC-12 NG, a $4.5 million aircraft, Earhart says. The completion of this trip has earned her the title of the youngest woman to circumnavigate the globe in a single-engine aircraft. But then again, Earhart says, the feeling of exhaustion is what fuels her to keep moving forward. “If my head hits the pillow, and I’m completely worn out because I did as much as I possibly could — that’s my thing. That’s what gets me excited to get up and do it again,” Earhart says. And do it again she does. Each day, Earhart juggles a career as a motivational speaker while simultaneously acting as the founder and president of the Fly With Amelia Foundation, which grants flight-training scholarships to young women between the ages of 16 and 18 years old and fosters aviation opportunities for all through an aviation-based educational curriculum, according to her website. The foundation is of particular importance to Earhart as a way for her to give back to the aviation community. 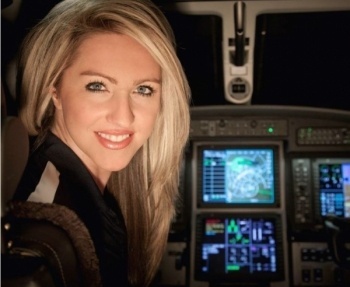 Through her personal experience, she learned that one of the most difficult parts of pursuing her private pilot’s license was figuring out how to pay for the training, which can cost anywhere between $7,000 and $9,000. By way of her foundation, she can try to help relieve some of the monetary stress for the next generation of female pilots. Earhart says her foundation currently has 11 young women going through flight training. When she’s not speaking at conferences or universities and when she isn’t too busy running her foundation, Earhart can be found near the Centennial Airport, flying. Getting off of the ground and up in the sky allows her to forget the small things that bog her down from day to day. Flying allows her to focus on other things, like the responsibility, discipline and knowledge required to fly safely. Earhart is currently training for her commercial pilot’s license in a Cessna 182RG, which she says will allow her to be a flight instructor one day. How does she have the energy to do it all? “I think that when you’re doing things that make you happy, you have as much energy as you need,” Earhart says. For the last seven months, Earhart has been writing a book about the planning and the execution of her flight around the world. On Tuesday, April 14, Amelia Rose Earhart will be attending the Democratic Women of Boulder County’s monthly program at the Hotel Boulderado to speak about her historic trip, as well as her advocacy work. The event begins at 6 p.m. and includes dinner and the program for $75 per ticket. Registration for the event can be completed at www.dw-bc.org.